Since 1993, Dr. James Frizzell has led Frizzell Dental in Niagara Falls, Ontario, maintaining a private practice staffed with four dedicated oral hygienists. James Frizzell, DDS, has operated a Niagara Falls, Ontario, dental practice for the past 18 years, offering patients courteous and dependable oral healthcare. Dr. Frizzell and his staff of four hygienists provide patients with general dentistry as well as restorative and cosmetic procedures. His expertise includes life-like crowns, fillings, root canals, and bridge work, with complete periodontal care also available. Dr. James Frizzell completed his undergraduate studies in chemistry at the University of Toronto, earning his DDS at the same institution’s Faculty of Dentistry. He opened his current practice in Niagara Falls in 1993, slowly building a word-of-mouth reputation for quality and affordable dental care. A hallmark of Dr. Frizzell’s approach is treating patients the same way he himself would expect to be treated by a trained physician: with professionalism, compassion, and respect. He focuses on near pain-free procedures that enhance patients’ smiles, offering teeth whitening, bonding, inlays, onlays, and veneers as cosmetic options. James Frizzell, DDS, and his staff maintain strict infection-control standards throughout the office, wearing protective eyeglasses and disposable gloves and regularly discarding all disposable items. When disinfecting instruments, he employs a steam autoclave method that effectively sterilizes drills and picks at 340º Fahrenheit. Dr. Frizzell utilizes state-of-the-art dental equipment for the safety and protection of his patients, including digital radiographs that emit low radiation and noninvasive oral cancer screening technologies. Dr. James Frizzell encourages his patients’ active participation in their dental care, taking time to thoroughly answer any questions that arise. This follows his core belief that well-informed clients are more likely to achieve and maintain optimal levels of oral health. Dr. Frizzell holds membership in the Canadian Dental Association and the Ontario Dental Association, staying up-to-date with the latest cosmetic care and technology advances through continuing education. 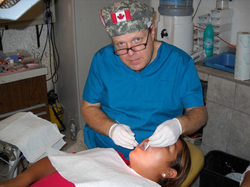 He undertakes volunteer dentistry work whenever possible; most recently he assisted orphaned children at a dental clinic in Mexico. James Frizzell, DDS, enjoys fishing on Lake Ontario in his free time.